Slow day on the Intertubes for UMass football stories, so let's look at where UMass stands on recruiting as we go into the final stretch before Wednesday's Letter-of-Intent Day. UMass has some visits planned this weekend. The Minutemen currently have 16 verbals. defensive help everywhere especially in the front seven. On the kicking front, UMass has a verbal from Michael Caggiano. Most teams make kickers walk-on (even highly rated ones), but the Minutemen apparently offered a scholarship to fix the most glaring need from last year. UMass has verbals from two running backs: Sekai Lindsey and Marquis Young (both rated three stars by 247Sports). Lindsey could have an immediate impact in 2015. The Minutemen have commits from five offensive linemen: Joe Parsons, Michael Yerardi, Jack Driscoll , Derek Dumais and Reche Thomas. UMass will now have 20+ offensive linemen on the roster. All the recruits are true freshman and will help down the road. Thomas is probably the highest rated recruit in this class (so far). The conventional wisdom in FBS is to recruit a QB every year. This year James Sosinski a 6-7 230 pound QB from Chandler, AZ joins the team. The Minutemen have only one receiver, TE Artayvious Lynn a 6-6 200 pound player from Bossier City, LA. On defense UMass has two defensive linemen: Mario Patton (three stars from 247Sports) and Aaron Kinsey. The de-commitment of Desjon Robinson hurt this group. 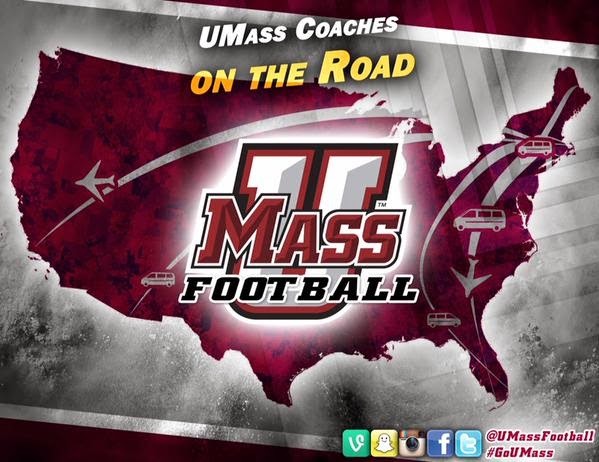 UMass has commits from two defensive backs: Lee Moses from Warwick, RI and James Oliphant from Fort Lauderdale. Ten of the 16 verbals are offensive recruits. It seems we have addressed some critical needs on the offensive side of the ball. On defense, thus far, it does not look like this recruiting class will have an immediate impact. We could use some JUCO or FBS transfers on the defensive side. The NY Giants blog "Big Blue" takes a look at the more than 500 prop bets available for the Super Bowl. BTW, Mrs Blog and I met at a Super Bowl party. If you're planning one for tomorrow, be sure to invited your single friends. UMass Athletic Director John McCutcheon leaves for University of California Santa Barbara. Matty Vautour has an article on McCutcheon leaving that includes some comments about UMass football. The UMass Daily Collegian has a post on McCutcheon and his comments on leaving. UC Santa Barbara college newspaper has the announcement. The Boston Herald has some notes about the change. It also mentions BC will play two FCS teams this year. Only one FCS game counts towards bowl eligibility. Obviously, UMass needs a young and energetic person at AD. The recent formation of the Power Five alliance is a game changer (pun intended) for college athletics. This is really going to change all college sports. If the Power Five go to a semi-pro model with paid athletes, what is that going to do to all other sports?The non-Power Five went along with the full-cost-of-attendance because, according to a number of reports, the fear the Power Five would take the basketball tourney with them. Tile IX changed the landscape of college sports. The Catholic schools could no longer put 90% of their assets into one or two sports. It effectively halved the athletic money available for those schools. Even mighty Notre Dame struggled with the new model. The Power Five is going to make an even greater impact. What will happen? I don't know, but if paying a person says there is a value added to a product by their labor, will colleges really pay for track-and-field, cross country, swimming and other sports? As for UMass football, obviously we need a conference. The bowl tie-ins, the media packages and the scheduling are necessary to control costs and stabilize the program. ESPN has more on the 2015 Boston College schedule. The Ralphie Report looks at Colorado's recruiting rankings. South Florida.com says former FIU head coach Mario Cristobal is doing well at Alabama while the Panthers flounder. SB Nation reports Allen Edwards, a 6-4 245 pound DE from Dean College in Massachusetts has verbaled to Pitt. Edwards had offers from UMass and Idaho (probably because of Charlie Molnar). The UMass website reports that the Minutemen have increased the number of Academic All-Conference selections every year since joining FBS and the MAC. The UMass Athletics Twitter feed says 25 Minutemen players made the Dean's List. The UMass Daily Collegian has another article on Marcel Shipp's leaving for the Jets. It has some player quotes about Shipp. Roubins Joseph and Sha-Ki Holines, friends and former Commerce teammates, will line up opposite to each other next year when UMass plays at Buffalo. Phil Steele has UMass tied for #2 in the college football universe in returning starters in 2015. The College Football Playoffs looks at the ramifications of Navy joining the AAC in 2015. The Irish Illustrated looks at the gains and losses to NFL draft by Notre Dame's 2015 opponents (includes UMass). The LA Times has college football recruiting 101. UMass will ban dorm visitors for the Super Bowl. Dan Malone has an article on player making the All-Academic team here. The complete MAC All-Academic team here. Congrats to all the players who made the All-Academic team! UMass running back coach Marcel Shipp has been hired by the NY Jets to coach the same position. Announcement of Shipp's hiring by the New York Jets website. North Jersey.com also has a post on Shipp's hiring. Matty Vautour has an article here. Besides Shipp's presence as a position coach, he was well-known in New Jersey, an area UMass has targeted in the past for recruiting. That may be a factor in hiring a replacement. Max Moore of Hustle belt talks about recent UMass three-star RB verbal Sekai Lindsey. The Herald-Dispatch says Marshall will dominate Conference USA in perpetuity. ESPN and the NFL want the college football playoffs to move playoff dates. Well, my snow blower is all gassed up and I'm ready to do battle. Only about four inches of snow so far in Jaffrey. Max Moore of Hustle Belt is excited about kicker Mike Caggiano verbaling to the Minutemen. Mike Karpinski has a post about the seven UMass commits. Will the FBS full-cost-of-attendance stipend force FCS schools to do the same? Interesting point. Will the non-FBS schools who want to be top-tier in other sports (Villanova in hoops, UMass-Lowell in hockey for example) give full-cost-of-attendance to those sports. Anything they do for a men's team has to be done for the women's team because of Title IX. Could basketball players at Villanova, men's and women's get the stipend and other sports athletes not? MLive.com has an article on Eastern Michigan wanting to bale on their game with Michigan State. The Star-Telegram says deflategate is all about home field advantage and hating on Bill Belichick. Patriots fans will not be surprised that Bill is not held with a lot of affection in other parts of the country. ESPN reports 45,000 people showed up for Ohio State's Nation Championship celebration. Dan Malone reports UMass received seven verbals from it's recent campus visits. The UMass Daily Collegian also has an article on the commitments. Some are recruits I've blogged about before; four are new. On the ones previously covered click on the link for images, bios and other links posted at that time. Michael Caggiano, a 5-10 kicker from Manalapan, NJ. See previous blog coverage. NJ.com has an article on Caggiano's verbal. James Oliphant, 5-9 170 pound DB/Athlete from St. Thomas Aquinas Fl. See previous blog coverage. Reche Thomas, a 6-4 325 pound OL from Varo Beach, FL. See previous blog coverage. 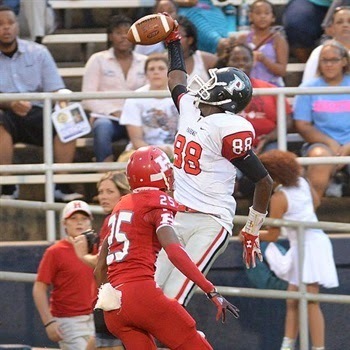 Artayvious Lynn, a 6-6 200 pound TE from Bossier City, LA. Was highly rated while participating in a national prospects camp. Lynn chose the Minutemen over an offer from South Alabama. Hudl.com has 15 ways to kill a quarterback. Chose the Minutemen over offers from Appalachian State, Cincinnati, FIU, Georgia Tech, Indiana, North Carolina, Pitt, South Alabama and Temple. Max Preps has some stats and video. The Time-Record has a story about Harley verbaling to UMass and some stats. This weekend's commits look like a good group. Michale Caggiano has a chance to be a four-year starter for the Minutemen. UMass fans hope he fixes a two-year train wreck in the UMass kicking game. Kicking is offense. Punting is defense. Caggiano has the potential to also be a strong punter. Running back Sekai Lindsay is another player UMass fans hope pans out. Despite the fact the Minutemen had several three-star running backs on the roster, the last two years have finished with former walk-on Shadrack Abrokwah as the starting RB. The UMass ground game is nowhere at the level of the Blake Frohnapfel and the passing attack. UMass needs better production from the running backs to be even in the middle of the MAC for a quality running game. Boston College was the lone vote against cost-of-attendance for college athletes. UMass has hired Mark Michaels as special teams coordinator and outside linebackers coach. 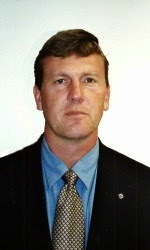 Michaels replaces Ted Daisher, who was fired by Whipple on September 16, 2014. Daisher had the unusual distinction of being fired by both Molnar and Whipple. Michaels seems to be a good hire. He has worked with Whipple before and knows his management style. He also has extensive NFL experience. Michaels last worked as a high schools coach in the talent-rich Tampa area of Florida. This article from 2012 interviews Michaels and asks about his coaching career in FL. 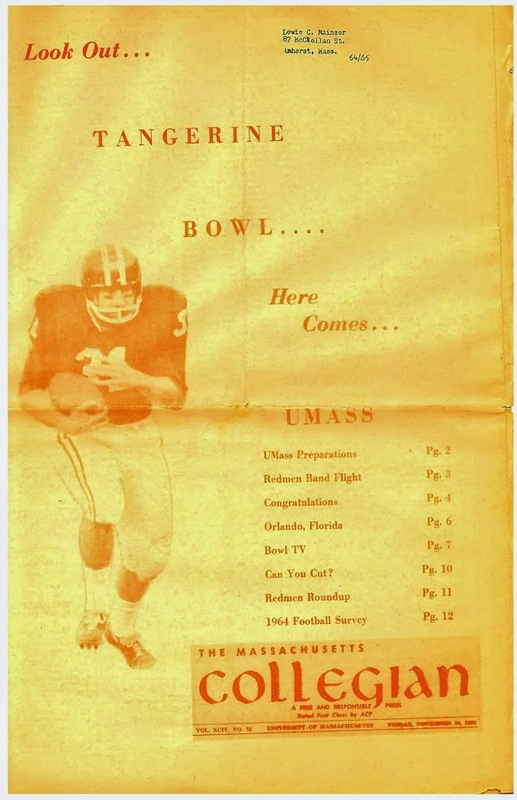 You remember Molnar added Allen Suber to the UMass coaching staff with the probable intent of increasing the Minutemen recruiting presence in Florida. Suber only lasted one year. With six years of coaching in the Tampa area, Michaels should have some connections that would help recruiting. UMass psychology professor Susan Whitebourne comments on deflategate. The Senior Bowl plays today, with two MAC players on the roster. In November, UMass offered to Trae Philpots, a 6-4 235 pound DE/LB from Creekside HS in Georgia. Last Sunday, he verbaled to Middle Tennessee State. Maine will play at BC for the first game of 2015 season for the Eagles. BC's OOC schedule of Maine, New Mexico State, NIU and Notre Dame seems likely to be a 3-1 run. Central Michigan's HC Dan Enos left to become offensive coordinator at Arkansas. Hustle Belt looks at possible replacements. The Lansing State Journal says the MAC is hard on coaches. If you missed it. Khalil Mack, who kicked our butts in 2013, was named ESPN's NFL Defensive Rookie-of-the-Year. 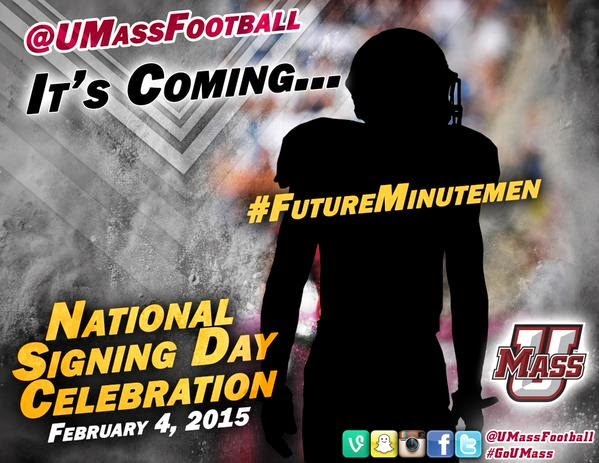 UPDATE: UMass will hold a football signing day party at the Amherst Brewing Company on February 4th. Paul Bys, UMass equipment manager, explains to Boston.com how footballs are treated prior to a game. SB Nation has everything you need to know about deflategate. 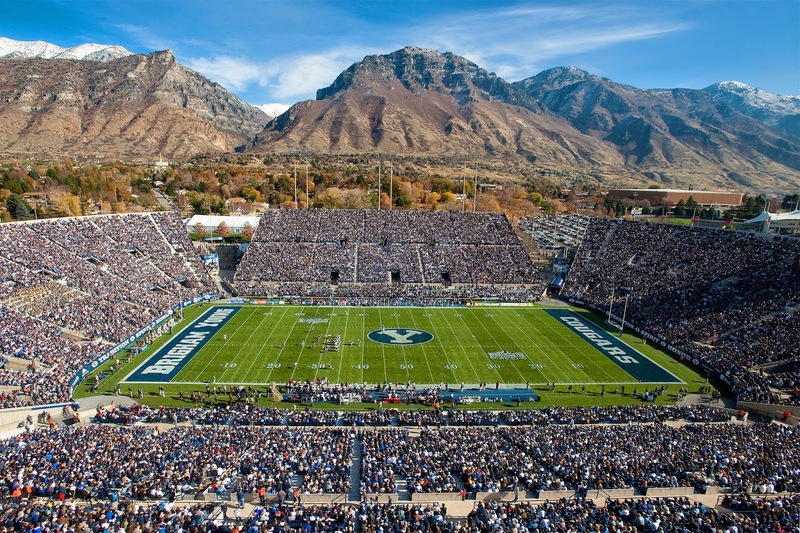 BYU has scheduled a home-and-home series with Michigan State bumping a scheduled UMass game. The only alternative open date for both squads is October 15th. UMass' 2016 schedule. BYU's 2016 schedule. Eastern Michigan, who was to have a three-for-one home game with MSU with one of the games schedule for 2016, has canceled the arrangement. A Bleacher Report writer ranks conferences by the quality of the league's coaches. Olympic proponents outline Boston's winning bid proposal. NoBostonOlympics.com says it'll cost at least $19 billion, more than the Big Dig. Boston mayor bans city employees criticizing the cost of the Olympics bid. The Blog awaits a Globe editorial about protecting the interests of the Commonwealth's taxpayers. A number of recruiting services report UMass has offered to Jack Beneventi, a 6-6 185 pound pro-style QB from Benet Academy in Illinois. Originally verbaled to Iowa and had his offer pulled. Has offers from Notre Dame, Louisville, Illinois, Western Michigan and Wyoming. Next year's OOC opponent Colorado still doesn't have a defensive coordinator. Cleveland.com will have a MAC-themed letter-of-intent day podcast today at 4:00pm. Miami (Ohio) cornerback Quinton Rollins has had a interesting college career. He'll be playing in the Senior Bowl this weekend. CBS Sports says the Power Five will change the financial structure of college football. "People that presumed this will start a real groundswell [to cut football], it will be the opposite," Steinbrecher said. "Very clearly [football] adds value to the institution." MLive.com says James Ihedigbo was a big upgrade in the Lions secondary. BTW, Ihedigbo was second in the entire NFL for TFL by safeties. The UCONN blog looks at potential offensive coordinators for the Huskies. The first listed is Charlie Molnar. 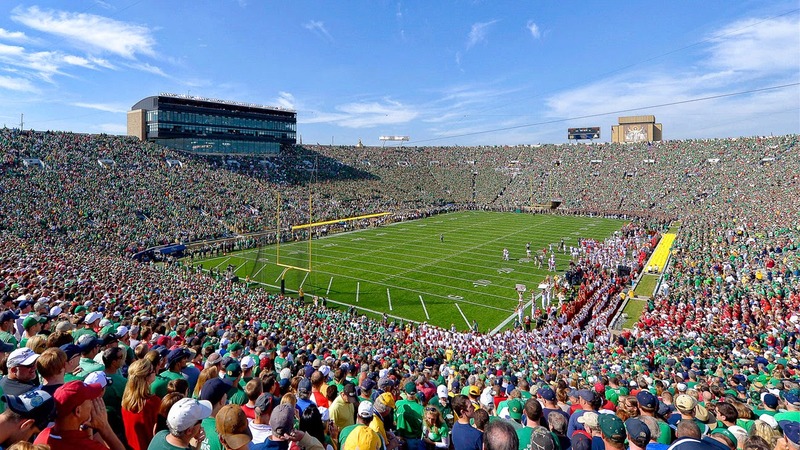 The BC Blog "BC Interruption" picks Notre Dame as #11 in a 2015 preseason preview. CBS Sports reports an early signing period has been formally recommended. The Metro News looks at what the early signing period will mean for college football. The final Sagarin Ratings have the FCS Missouri Valley Conference ranked #13 out of 33 Conferences ahead of the MAC and Conference USA. Sagarin's final ratings has UMass at #154. College Football also had a deflated ball scandal. OT, but UMass is replacing the textbook store with Amazon. I've blogged about Jared Southers, a 6-4 290 pound OT from Seton Hall Prep in NJ several times before. He verbaled to Vanderbilt on Sunday. Southers had offers from Rutgers, Temple, UConn, UMass and Old Dominion. UMass fans strike back at the Globe and defend UMass football. Any more I missed? Good work to all who wrote the Globe. This article from the Fredericksburg Free Lance Star features Steve Frohnapfel, who racked up a lot of driving miles last fall. Special thanks to blog reader "Nick" for the heads up on a link to Draft Countdown's Scott Wright discussing Jean Sifrin's changes in the NFL draft. The mention of Sifrin is about minute 52 in this podcast. A lot of high-priced NFL Draft commentators are going to be wrong about Sifrin, because they'll only look at his tape and stats. They won't realize Sifrin had essentially no summer camp before he started playing. With more reps at his position and more coaching, his blocking and pass catching have big upsides. If he goes 5th round or below, he'll be a steal for some NFL team. Marshall and C-USA did well in bowl viewership. SB Nation says Western Michigan will again out-recruit a bunch of Power Five teams. Does McGuirk have Wi-FI? Duck and Bucks fans blew through 6 terabytes of data at the College Football National Championship game. I've blogged about Will Fries, a 6-6 270 OG from Cranford, NJ three times before. Fries just picked up an offer from Clemson. That brings Fries' offers to eleven. The article says he's interested in majoring in business, so UMass with Isenberg Business school should be in the running. Former UMass player and coach Malik Hall joins Penn as the Quakers defensive line coach. Hustle Belt looks at Jean Sifrin's chances in the NFL Draft. NFL Draft Scout's 2015 TE rankings. Campus Insiders ranks 2014 coaching hires including Mark Whipple. One Massachusetts team that had a great year was MIT. The Engineers went undefeated in the New England Football Conference. MIT also won in the first round of the Division III tourney. If you missed it Joe Paterno has had his victories reinstated. ESPN has more. Cadillac News.com says there should be 24 teams in the FBS tourney. A Bleacher Report writer predicts NIU will win the MAC championship in 2015. Good luck to the UMass Cheerleading Squad at the Nationals this weekend. Details on the Cheerleaders Facebook page. Former UMass graduate assistant Steve Spagnuolo is back as defensive coordinator for the Giants. The 2018 UMass schedule is filling in. Charlotte will play both UMass and Tennessee in 2018. Hustle Belt has the MAC Conference recruiting power rankings going into January. The UAB faculty voted "no confidence" in President Ray Watts over his decision to drop football. Some members of the faculty cheered and chanted "UAB" after the vote. Can we get some of those professors up here? Phil Steele looks at how teams fared against Vegas in 2014. Dan Malone has a story that quotes Coach Whipple as saying "I don't think there's any doubt Jean Sifrin can make it in the NFL". Losing a talent like Sifrin hurts, but it can't hurt the program if another Minutemen player gets drafted. If Sifrin gets picked it'll be three picks in three years: Michael Cox, Rob Blanchflower and Jean Sifrin. 2015 could be a special year for UMass; I think Blake Fronapfel and Tajae Sharpe could comprise the Minutemen's first multiple player NFL draft since 1965 when Milt Morin was picked in the first round and Bob Meers went in the seventh. ESPN says this year's NCAA convention could herald a big change in college athletics. Former NIU QB Jordan Lynch, who was cut by the Bears, signs with the Edmonton Eskimos. UMass held Ball State RB Jahwan Edwards to 36 total yards on November 9th, but Hustle Belt previews his NFL draft chances. 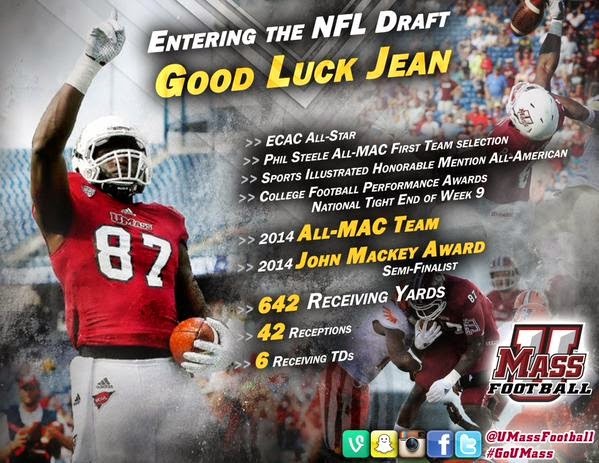 UMass confirms that Jean Sifrin will declare for the NFL draft. Dan Malone has an article on Sifrin. MassLive has video highlights of his one-year career with UMass. Matty V. also has a post on Sifrin leaving. WWLP-22 has an article on Sifrin. Sifrin totaled 11-9 GP-GS 42-642 15.3 AVE 6 TD 76 LONG 58.4 AVE/Game. As Matty V. says in his article, his replacement in the receiver hierarchy will probably be Rodney Mills. Mills does not have the NFL size of Sifrin, but as long as he is as productive, the Minutemen won't suffer. Mills went 12-7 GP-GS 30-489 16.3 AVE 5 TD's 72 LONG 40.8 AVE/Game. The Blog hopes that Sifrin would return to UMass after (or during) the NFL and finish his degree. A number of former UMass players have done just that. UConn's last home game on December 6th against SMU drew 5,300 at Rentschler field. UConn averaged 27,576 and BC averaged 34,270 home attendance in 2014, another reason that the three New England schools should play each other every year. Bleacher Report ranks the MAC conference #11 after the bowl season. A mid-December early signing period could be on the horizon. AZ.com ranks Notre Dame #22 in pre-season 2015. If the Irish find a QB, they could be top-ten material next year. 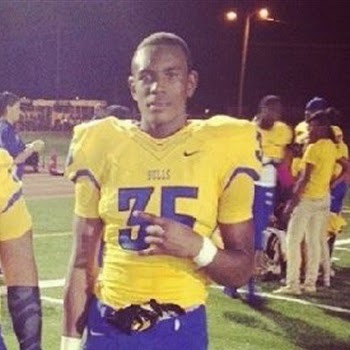 Scout.com reports UMass has offered to Keyonte Holley, a 6-0 240 pound LB/FB from Wauchula, FL. UMass has offered Holley. So has Florida International as a fullback." Holley also has an offer from FIU. On January 13th, 2014, UMass announced Mark Whipple would be introduced the next day as the 30th head coach of UMass football (29 if you count his two eras). Dan Malone says the first FBS playoff was a smashing success, and now it should be 8 teams. Actually, it should be 16 teams, like FCS did for years. All the conference champions of the Power 5 and the Group of five and 6 at large teams. An international sports site has a lengthy biography of James Ihedigbo. Athlon Sports says one of the winners of the 2014 Bowl season was Conference USA. NIU's Da'Ron Brown will be one of three MAC players in the East-West Shrine Game. SB Nation previews the game. Bleacher Report grades former UMass player and graduate assistant Neal Brown hiring as HC of Troy as a "B". 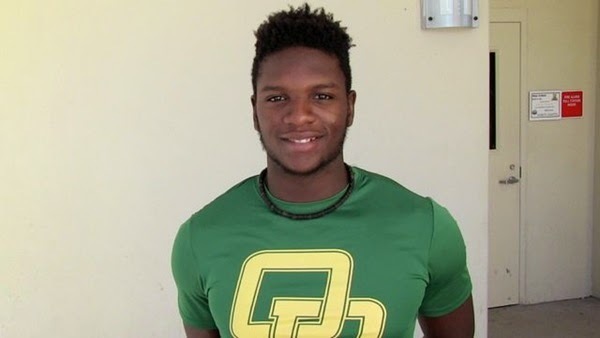 Scout.com says UMass has offered to Jehodja Jean Baptiste, a 6-3 240 DT from Orlando, FL. 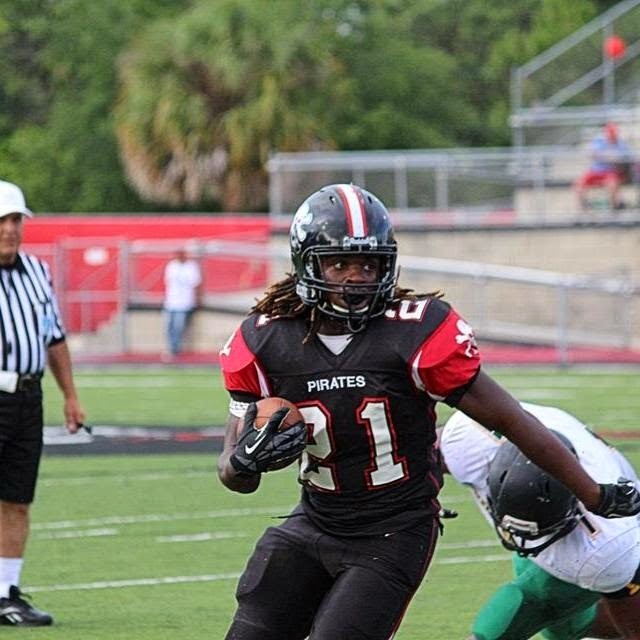 "Jean-Baptiste would love to hear from more in-state schools, like Florida Atlantic, South Florida, and Florida State. His Oak Ridge teammates have given him the nickname “the Lumberjack,” because of what he does on the field. “Lumberjacks bring the wood,” he said." 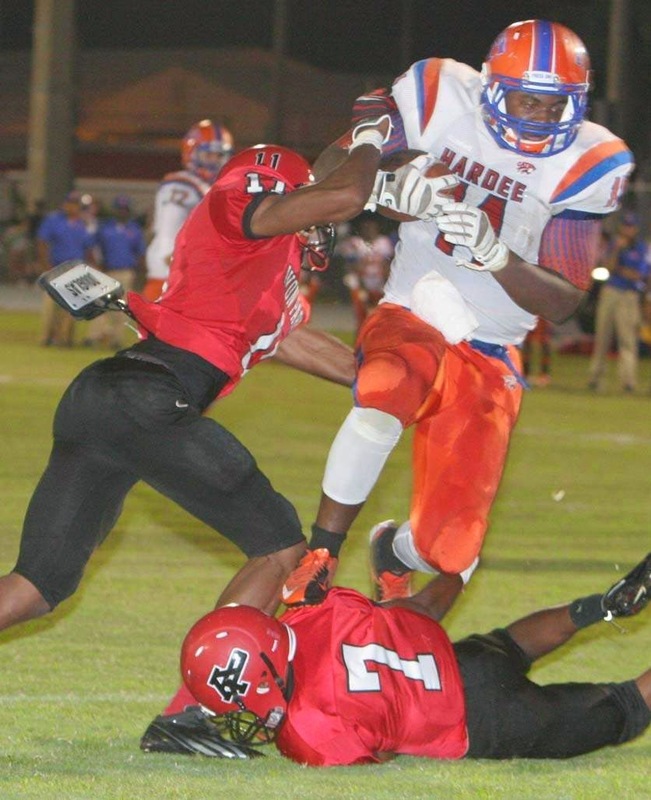 Besides UMass, he has offers from Alcorn State and Charleston Southern. Drawing FBS interest from Florida International and South Florida. Marc Ross, who has a masters in Sports Management from UMass, is a candidate for the GM position for the Chicago Bears. The Isenberg Business school Sports Management program at UMass is one of the top sports management schools in the nation. The schools alumni are scattered all over the professional and college landscape. The EMU student paper looks at the Eagles 2015 schedule including the visit by UMass. The NY Times says College football is powerful. Philly.com says tonight's National Championship game is the start of a new era. As you probably know by now the Globe took another shot at UMass Football over the weekend. I'm not going to link to it (why give their failing business model any traffic), but you might want to post some replies or write the editor. It would be nice if someone stood up for us, like Stan Rosenberg, for instance. He's from Amherst, he claims to be pro-jobs, pro-Western Mass and he's President of the State Senate. As I have stated a number of times, every time some Mass resident buys a tank of gas to go the game, buys a meal at restaurant, or makes any UMass-related purchase, the state government gets a piece of the action. UMass football is beneficial to the Commonwealth; something the Globe will never be. OT, but while looking for UMass football recruiting news, I hit this piece about Bruce Brown, a four-star hoops recruit. The article says the Minutemen are recruiting him actively. As I did yesterday, Dan Malone breaks down the 2015 UMass football schedule. Mrs Blog and I are considering a road trip out to Colorado to see Ralphie Run and taking in South Bend on the way back. That would mean we would miss Temple at Gillette, but would add two road games. I gotta go to Notre Dame. Colorado is looking for a defensive coordinator. Irish WB Everett Golson, a graduate senior with one year of eligibility left, may transfer. The complete MAC Conference schedule for 2015 is here. The FCS National Championship Game is today. With UNH losing in the semi-finals, there is no CAA presence, but North Dakota State could win a unprecedented fourth straight title. I've Blogged about Kwanii Figueroa before. NJ.com has updated his recruiting status. 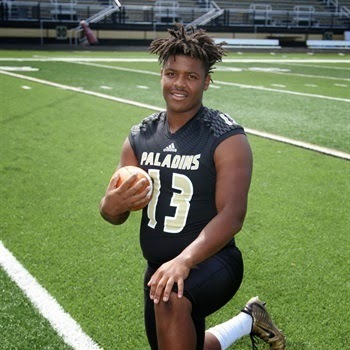 Figueroa is a 6-2 270 pound DT from Paramus Catholic. Hudl.com has video and reports 51 TT and 8 sacks in 2014. The MAC has announced it's 2015 schedule (but not the dates). Not an easy schedule. Colorado is not a good team, but playing them at mile-high Boulder is a difficult road trip. Notre Dame as I blogged recently, will lead the nation in 2015 in returning starters. The Irish could be a Top-Ten team in 2015. Temple crushed Vanderbilt 37-7 and played Penn State tough at Penn State losing 13-30. Florida International lost to Bethune-Cookman, but played high-powered Rice pretty well. So far in FBS, UMass has not won over a non-MAC team or beaten a MAC team with a winning record. The Minutemen will have to do both to bowl-eligible in 2015. Penn State QB D.J. Crook who went 6-9 and 1 TD against UMass is transferring to Albany. According to an unofficial list on NFL.com UMass TE Jean Sifrin will declare for the NFL draft. January 15th is the deadline. 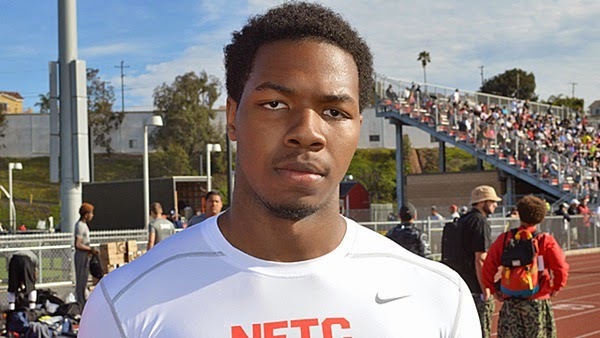 Scout.com reports UMass has offered to Kevin Scott, a 6-5 280 pound DT from Los Angles. Partial quote from Scout.com article: "In just his first year playing football, Scott has used his one year to a big advantage, racking up a slew of offers in the last couple of weeks, including offers from Fresno State, New Mexico State, UMass and UTEP in the past week alone." Since that article was published on December 5th, Ole Miss and Purdue have also offered. Dan Malone reports former UMass players Rob Blanchflower and Julian Talley signed NFL futures contracts. Steelers notification here. Blanchflower's Steeler's bio here. In addition, Julian Talley signed a reserve/futures contract. Talley's Giants bio here. We can hope Rob Blanchflower will stay healthy for 2015. He plainly has the talent to play in the NFL. All he needs to do is be at 100% to show what he can do. Last year I watched some of the Giants pre-season games and Talley caught everything they threw his way, but they didn't go to him often. I think it's kinda unusual to spend two years on the practice squad, but the Giants must like what they see. 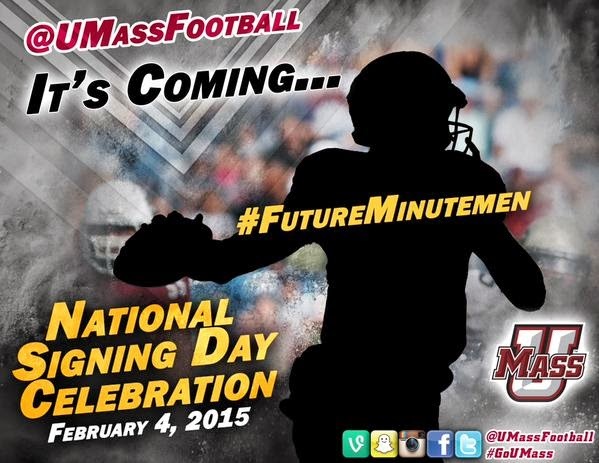 UMass apparently will have a recruiting event on February 4th. No details yet on the Minutemen Athletic site. Could Charlie Molnar end up coaching at Syracuse? Troy completes their 2016 and 2018 schedules, they have UMass at home in the first and visit UMass in 2018. UMass will play Buffalo away and Miami at home in 2015. College Bowl attendance was down, TV viewership up. The UMass Football Blog will not publish Tuesday and Wednesday. I'll be in VAMC White River Junction for a couple of days. I'm fine; routine stuff. Several recruiting sources including Twitter, indicate Reche Thomas, 6-4 325 pound OL from Vero Beach, FL will take a recruiting visit to UMass on 01/23/15. Thomas has 15 total offers including 9 from FBS schools. Purdue, Illinois, Marshall and Temple have offered. James Ihedigbo gets a mention in this Boston Globe article about New England players in the NFL playoffs. Toledo's Kareem Hunt ran for 271 yards in the Rockets 66-44 win over Arkansas State in the GoDaddy Bowl. I watched the game and Hunt was the best player on the field. Hustle Belt covers the Rockets win. Hunt ran over the Minutemen on October 25th, with 198 yards and a 7.6 yards/carry ave. UMass had 52 total yards rushing and the Rockets had 295. Blake Frohapfel threw for 445 yards in the loss. Toledo's win meant the MAC went 2-3 in this year's bowls. A West Virginia newspaper writer says Conference USA earned respect with it's bowl performances. Phil Steele has the returning starters (an indication of strength for the next season) for the Power Five conferences. Notre Dame leads the nation with 19 starters returning. Colorado is tied for 9th with 16. We've looked at the 2014 Red Shirts. We've looked a the 2013 Redshirts. On June 5th, UMass announced eight walk-ons were joining the Minutemen team. How many of them who will earn scholarships will also affect the number of scholarships available for 2015 recruits. Matthew Wylie K 6-5 190 2 games played. 6-311 kickoffs, 1 Extra point, 0-1 Field goal attempts. Libby appeared in 10 games and will likely play a lot in 2015. Wylie had a tough start before being injured. I would think the jury is still out on him. Rodriguez drew some favorable coaching mentions during summer practice. He could make the rotation in 2015. The two linemen Denis and Previte are good athletes, but neither has the length that FBS coaches crave these days for offensive linemen. The tallest player on UMass' D-line last year was 6-3, so both could have a future on defense. Toledo plays in the Go Daddy Bowl at 8:00 PM on Sunday. That's the last MAC team still playing. It's also the last FBS bowl (not counting Oregon-Ohio State). The new College Football Playoff games set a cable TV record. Matty Vautour says sources from the UMass program believe Jean Sifrin will declare for the NFL Draft. Sifrin, at 27 years old, is probably wise to declare. I think he'd get more money after a bowl game, but there's always the chance of injury. If he's drafted, then it's a good trade off. A free agent contract would be less (a lot less) financially rewarding. Rodney Mills would be Sifrin's probable replacement at TE. Matty also reports grayshirts Randall West and Lamarriel Taylor will join the Minutemen for the Spring Semester. Randall West 6-4 220 spent the fall rehabbing a torn ACL suffered late in Senior season. By no being on campus this fall, he saved a redshirt season. 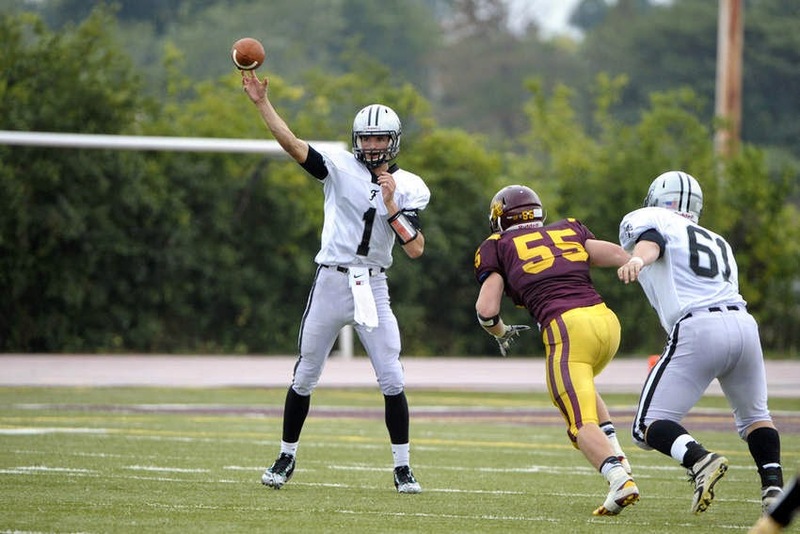 West played against top competition in North Jersey, so he could be a force at QB. He's another reason to go to the Spring game. Lamarriel Taylor 6-3 185 had 72 catches for 1,516 yards and 23 TD's for Mission Bay HS in CA. He should also prosper in Whipple's vertical passing game. Taylor was a two-star recruit on 247Spots. YouTube interview of Taylor from 2013. Hudl.com has senior season highlights. The Blog's sister lives in Eugene, OR. She relates that Eugene passed an ordinance banning fireworks except for the Fourth of July and New Years. I'll bet it was noisy in Eugene last night. NBC also reports the playoffs are a financial bonanza for the Power Five conferences. OT, but NBC Sports predicts the NIT for UMass hoops. Mrs Blog and I would like to wish everyone a "Happy New Year" to everyone. 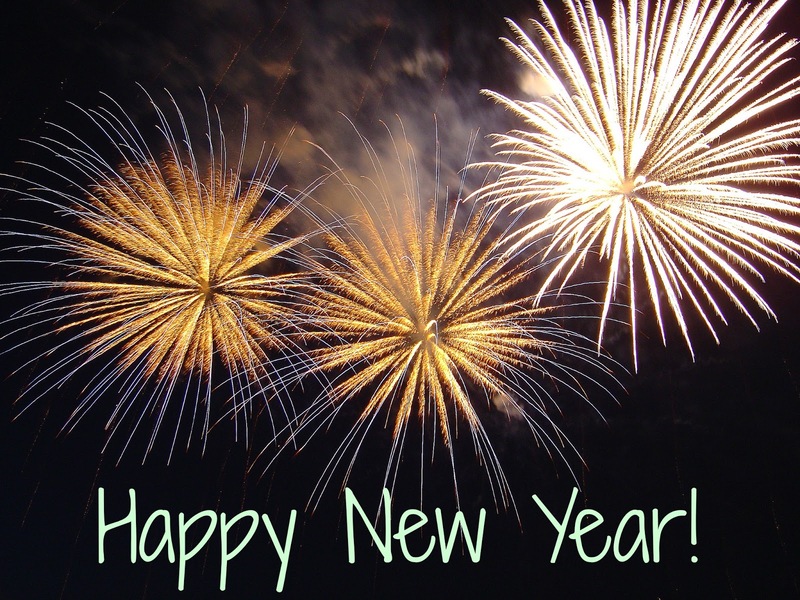 May 2015 bring you health and lots of UMass football. Speaking of 2015, one of the highlights will be the Minutemen's visit to Notre Dame Stadium. Everyone is going right? Come on, you've been watching the Golden Dome and those gold helmets all your life. You gotta go. I've already told Mrs Blog that if I die before September 26th, call a taxidermist, have me stuffed, dress me in my UMass gear and take me to the Notre Dame game. After that, she can stand me in the hallway and people can hang hats and coats on me when they visit. Dan Malone talks recruiting and expectations for 2015 with Bob McGovern of Maroon Musket on his latest podcast. Dan also has the top ten UMass sports stories of 2014. Five of the ten are football related. Matty Vautour says besides South Bend, Indiana, we're all going to the Boca Raton Bowl. Hustle Belt's New Year's Resolutions.